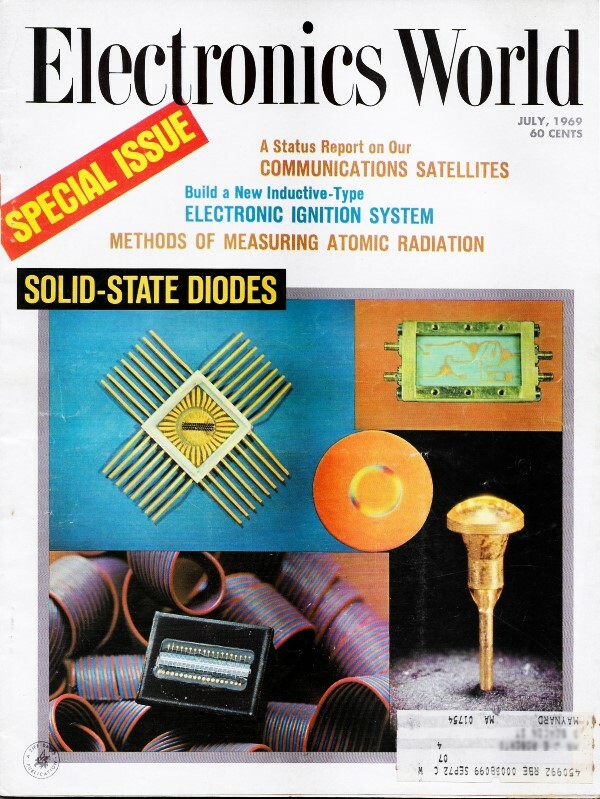 Photodiodes and phototransistors were relatively new on the electronics scene in 1969 when this article appeared in Electronics World magazine. Prior to semiconductor light detectors, vacuum phototubes did the job in cameras, motion sensors, light level detectors, medical imaging equipment, etc. High voltages and the large volume for containing components supporting vacuum tubes created hazards (especially with medical equipment), inconvenience, and high cost. What we take for granted nowadays in terms of price, performance, reliability, and size was all yet to be worked out with the new technology. This article insert discusses early development. The solid-state photodiode industry, enjoying some $6-million sales in 1968, is expected to reach $10 million by 1972. Photodiodes find wide application in many sectors of the industrial, consumer, and military markets; examples include light dimmers, alarms, card readers, detectors, and counters. There are two basic kinds of photodiodes: photovoltaic and photoconductive devices. In quantities less than one hundred, prices range typically from $2 to $15. Compared to the vacuum phototube, semiconductor photodiodes have greater sensitivity, are much smaller in size and weight, and can be operated in short-circuit and open-circuit modes. Limitations include drift with age, temperature sensitivity, and a poorer frequency response than the vacuum phototube. The photovoltaic diode consists of a relatively large silicon p-n junction that is exposed to light. Light photons impinging on the junction have sufficient energy to rupture a number of covalent bonds in the junction, thereby producing electron-hole pairs. No external bias source is required for operating the photovoltaic diode. If the device is short-circuited the current generated is directly proportional to the radiation. 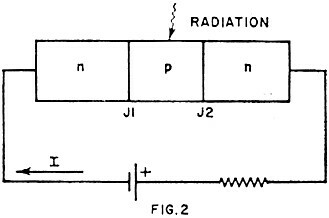 For open-circuit operation, the voltage developed across the diode varies logarithmically with radiation. Practically, if the load resistance across the diode is less than 800 ohms, short-circuit operation is generally realized. Open-circuit operation is obtained if the load resistance is greater than 10k ohms. An example of a photovoltaic diode operating in the short-circuit mode is a photodiode used in the sound system of a movie projector. Because a linear re­sponse of the photodiode is essential to avoid audio distortion, the effective input resistance of the preamp is kept below 800 ohms. Common to other solid-state devices, the electrical characteristics of photodiodes are temperature-sensitive. The rate of change (with respect to room temperature) of the open-circuit voltage is approximately -0.004 V/°C. Short-circuit current remains nearly constant with temperature. Typical operating temperature range for silicon photodiodes is from - 55°C to + 125°C. The reverse-biased photoconductive diode, for a given junction area, can generally be made more sensitive than the photovoltaic device. 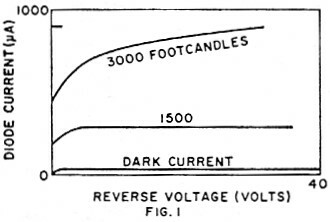 Without exposure to light and with a reverse bias as little as a few tenths of a volt, reverse current (due to thermal generation of electron-hole pairs), called the dark current, flows. When light falls on the junction, additional electron-hole pairs are released and the diode current increases. Typical V-I characteristic curves for a photoconductive diode are shown in Fig. 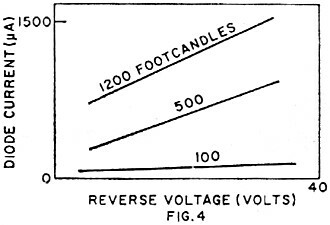 1 (1 footcandle = 1 lumen of radiation per ft2 of exposed surface). Increased output, as a result of the multiplication of light current, can be obtained in semiconductors by what is referred to as the hook collector mechanism. The mechanism is realized by having two junctions in the same device separated by a wide base region. 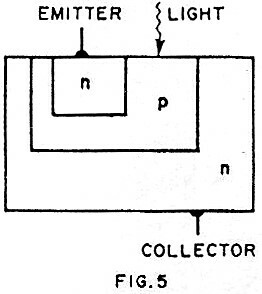 The resultant n-p-n structure is called a photo-duo-diode (see Fig. 2). Commonly used symbols for this as well as other photodiodes are illustrated in Fig. 3. Junction J1 is slightly forward-biased; junction J2 is reverse-biased. Light photons striking the p region liberate electron-hole pairs. The released electrons diffuse out of the p region toward the junctions; the holes, however, are trapped in the p region and form a positive surface charge which increases the forward bias of junction J1. The increased bias produces an increase in current I. Typical characteristics of a photo-duo-diode are shown in Fig. 4. An improved version of the duo-diode, the planar photodiode, is illustrated in Fig. 5. 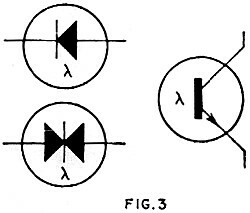 The difference between these two devices is that the n-p-n planar structure operates as a high-gain transistor, the base current being a function of radiation. There is no circuit connection to the base (p region), the device operating basically as a diode. The spectral response of a photodiode is determined primarily by the energy gap of the semiconductor material used in fabricating the device. Changing such parameters as junction location and material resistivity have a minor effect on the spectral response. In bandwidth-modulated light-communications systems, the response of the photodiode becomes significant. Turn-on times on the order of 25 ns and turn-off times on the order of 250 ns are possible under certain conditions. It seems reasonable to expect that the switching time response of photodiodes will improve in the future. A typical set of characteristics supplied by the manufacturer will include dark current, light current, rise and fall times, and light current sensitivity (microamperes per footcandle). These characteristics have meaning only if the test conditions, such as temperature, radiation wavelength, and diode voltage are specified. One of the leading innovators in the photodiode development has been Texas Instruments. Other companies offering a variety of photodiodes include Fairchild Semiconductor, G-E, Philco-Ford, RCA, Raytheon, and Solid State Products. Aimed for the ever-growing computer industry, arrays of photodiodes used for such applications as reading paper tape, are being manufactured. A recent example is an array that uses thick-film technology containing from five to twelve photodiodes. This component is offered by HEI Inc. of Chaska, Minnesota. Others making photodiode arrays include Fairchild Semiconductor and Motorola.